Fred Del Barrio owns several McDonald's franchises in the Valley. Del Bario is seen with his collection of McDonald's memorabilia Tuesday, April 3, 2018, in McAllen. McALLEN — When Fred Del Barrio was a senior in high school back in 1984, he was faced with a generation-long predicament: getting a first job. If he didn’t, there would be consequences with his father. Among other establishments, he walked into the McDonald’s on Conway Avenue in Mission and filled out an application in pencil. A few days later, he was informed that he got the job. Reluctantly, he took the offer to satisfy his father. He “didn’t really have a choice,” Del Barrio said. Though, that attitude was short-lived. By the time he was 20, he was the manager of the McDonald’s at El Centro Mall in Pharr — the first to open in the Valley back in 1974. By 23, he was the supervisor of three stores, and by 31, he had his own franchise. 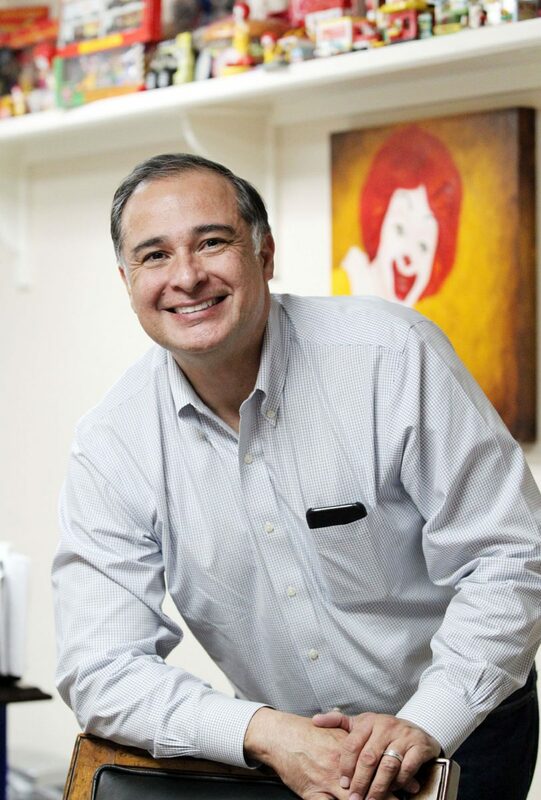 Today, Del Barrio, now 52, sits in his office — surrounded by McDonald’s memorabilia — the proud owner of 13 McDonald’s franchises who was recently named “businessman of the year” by the Rio Grande Valley Hispanic Chamber of Commerce. “For a man who is as successful as he is, he’s very humble,” Sakulenzki said. To his disdain, Del Barrio doesn’t spend too much time at any specific store. Fostering relationships with his employees is imperative when running a business, he said. It’s easy for him to do because at one point he was in their shoes. Though, the job has changed a lot since Del Barrio was in high school, and it hasn’t necessarily gotten easier, he said. A lot of the changes have been tougher to handle, though. If it were for Del Barrio, the new uniforms and contemporary design most McDonald’s have now would go back to the classic red roof buildings with the golden arches. Ronald McDonald, the company’s iconic mascot, doesn’t find his way toward marketing campaigns anymore either. After the U.S. saw a spike in childhood obesity rates, fast food marketing perceived to be directed toward children began to be criticized. With that, the playgrounds and iconic characters like Ronald McDonald and the Hamburgler lost their place in the company’s culture. But change is inevitable. And ultimately, McDonald’s remains one of the most successful food chains in the world because it’s managed to change with the times, at least according to Del Barrio.